I took this photo during a short day trip to Melbourne on Saturday. Despite living in Sydney for most of my life, it was actually my first trip to Melbourne (just something I’ve never really got round to before) and I went with my father to see some of the fabulous Christmas decorations around the city, particularly the Myer window displays. 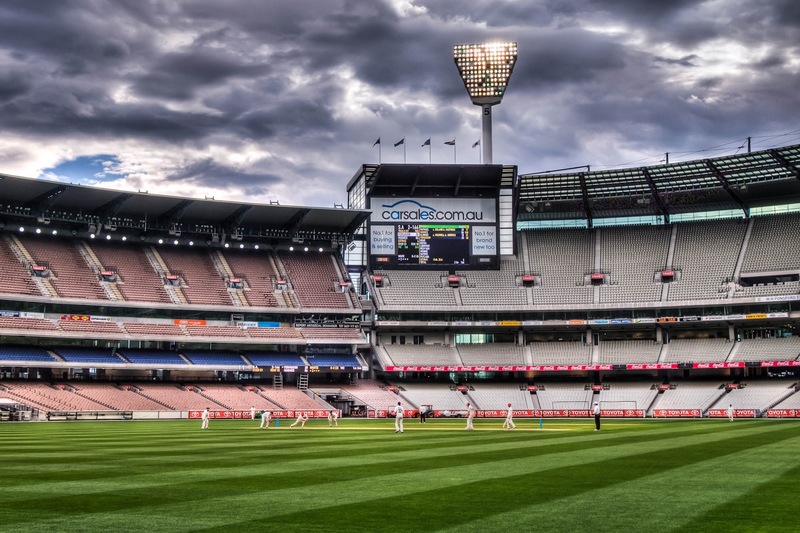 We then stopped in at the Melbourne Cricket Ground to watch a session or two of Victoria taking on South Australia, which is where I took the photo. It was a good day’s cricket, with Phil Hughes scoring a hundred, but what surprised me was how few people were there. There couldn’t have been more than 350 people at the ground and as you can see in the photo, almost all of the stands were empty. I know Sheffield Shield games don’t attract huge crowds but I thought there’d be at least a few more people watching than that. It happens at most other grounds as well unfortunately and I don’t understand why as the quality of Shield matches is usually very high. I guess most people are just more interested in international matches and T20s. The haiqua came to mind while I was sitting watching the cricket and the clouds, thinking back over the past year. It’s been an eventful year, both personally and around the world, and that’s made me feel a little reflective and sombre lately. I guess that’s what inspired the haiqua’s tone.